Part 1 of 2 (More below) Mr. Media is recorded live before a studio audience of people who want to be writers more than they apparently want to take baths – P.U.! … in the new new media capitol of the world… St. Petersburg, Florida! So you want to be a writer, huh? Got a great idea for a book that everybody – and not just your mother – will absolutely, positively want to read? Before you start writing, consider reading a book: the fourth edition of literary agent Michael Larsen’s How to Write a Book Proposal. I know a thing or two about writing books – and book proposal writing secrets. Check Amazon – my byline is on 11 books and number twelve will be in the stores this time next year. There are two very different skills involved. 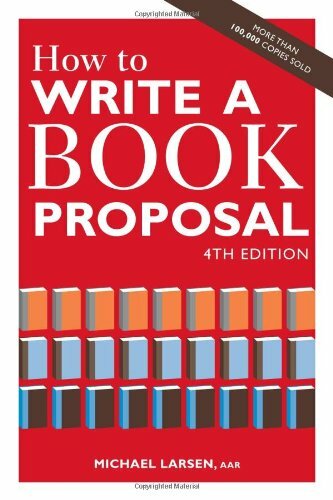 Proposals require the would-be author to clearly think out and commit to paper what the book will be abut, how might read it out and how the publisher can reach the right audience for it. It’s a marketing document, first selling you to an acquisitions editor, then laying out a roadmap for putting your creative output in front of potential readers. After that, writing a book is pretty simply. I’ll tell you about that another time. The thing I like about Larsen’s book is that it doesn’t abandon the would-be writer after the proposal is done, offering a slew of ideas for getting the finished book to market when it’s done. It’s a complete package, written in short, easily digestible nuggets. As for Larsen, he and his wife Elizabeth Pomada have been San Francisco-based literary agents since 1972. I suspect whatever question you’ve got, this book answers it.